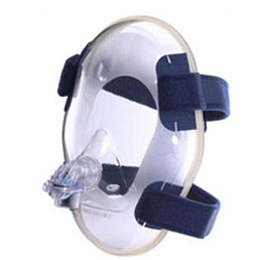 Respironics Total Face Mask comes with comfortable, easy-to-use headgear. Sturdy cloth side straps and a mesh crown strap keep the mask evenly and securely in place and help to prevent mask leaks. Adjustable Velcro tabs on the straps attach to hooks on the faceplate of the mask for stable placement. Provide continuous leak path in the circuit. Does not obstruct the user's vision. Allows patient to breathe room air if pressure is discontinued as in the case of power failure. Allows connection of a proximal pressure line or monitoring device. Enables fast removal of the mask. Attach to Velcro® hooks for secure placement.